It is with great pleasure the National Convention Committee of Delta Phi Mu Sorority, Incorporated announce the details of our biennial retreat La Cumbre! La Cumbre, meaning “The Summit” in Spanish, symbolizes our organization transcending in our pillars of scholarship, service and sisterhood. The first La Cumbre was held in 2010 in Atlanta, Georgia, and was a great success thanks to the innovation of Sister Loha Periera Melton. Keeping with this initiative, the National Board created The La Cumbre Committee to continue this effort. 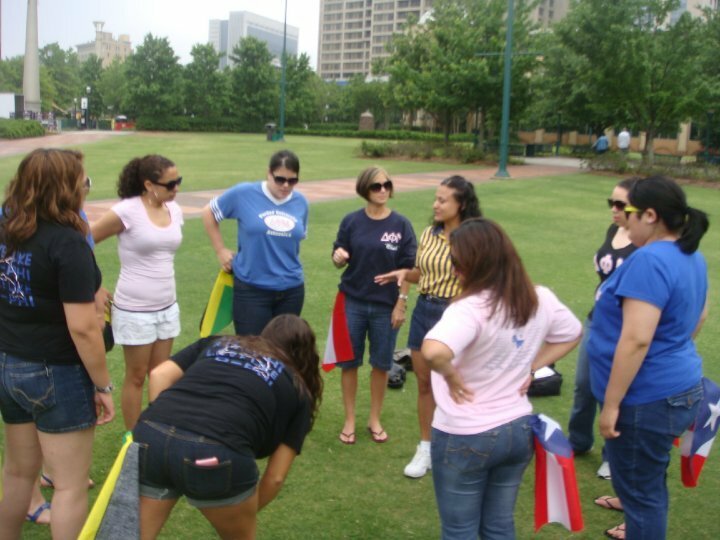 This year La Cumbre 2012 will be held in Memphis, Tennessee.Our theme, “Moving Forward In Sisterhood” highlights the progress of our organization and is a special time for all alumnae and collegians, active or inactive, to gather and celebrate our sisterhood in a fun and memorable environment. At this time La Cumbre has been postponed for a later date. More information will be provided soon. If you have any questions, please do not hesitate to contact Sister Jasmin Thurston ukdua@deltaphimu.org . Our 1st La Cumbre was celebrated in May 2010 and turned out to be a fabulous getaway and special treat for all those who made it to Atlanta. Sisters spent time getting to know other collegiate members and alumnae over dinner, breakfast, and the Atlanta Challenge in downtown Atlanta. Attendees also had the opportunity to spend the afternoon shopping, visiting The World of Coca'Cola, or catching up with old friends. La Cumbre is Delta Phi Mu's biennial National Retreat. Our retreat is a special time for all alumnae and collegiate, active or inactive members to gather and celebrate our sisterhood in a fun and memorable environment. A special thanks to our National Convention Chairwoman for putting together a fantastic event! Please join us for our next La Cumbre!